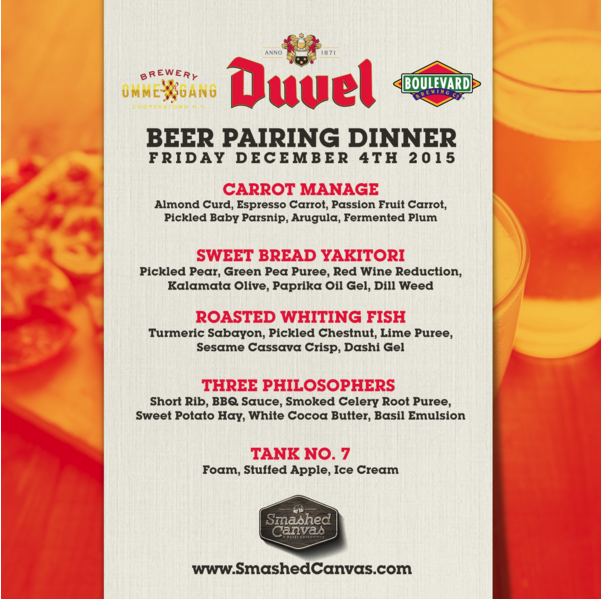 Tomorrow night, December 4, 2015, Brewed Events and Duvel will host a 5 Course dinner paired with the beers of Duvel, Boulevard Brewing and Brewery Ommegang! Chef Rafael Valazquez of The Contemporary Kitchen will be creating dishes for a unique dining experience during Art Basel 2015, taking place in Miami's Wynwood neighborhood. If you like great food, awesome beers and some of the best contemporary urban art around, check out this event. Tickets can be purchased by clicking the link above, which will take you to an Eventbrite page. Remember it's a limited seating event AND it's also TOMORROW!